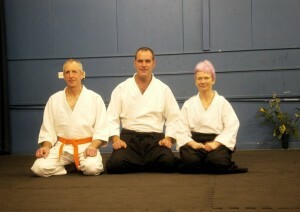 So it’s happened, and all the stress, superhuman levels of activity and busy lead up to the day is but a memory. We had a fantastic day, both in terms of weather and atmosphere, buzz and number of people who attended, all of whom, it seemed to me, had smiles and positive comments. Conversation was inspiring and the networking invaluable. Over 300 people turned out to have a self-guided tour around. There were also 25 stall-holders around the site demonstrating sustainable crafts such as green woodworking, charcoal burning, scything, basketmaking and spinning and selling everything from handmade soaps and perennial plants to organic vegetables and local apple juice. 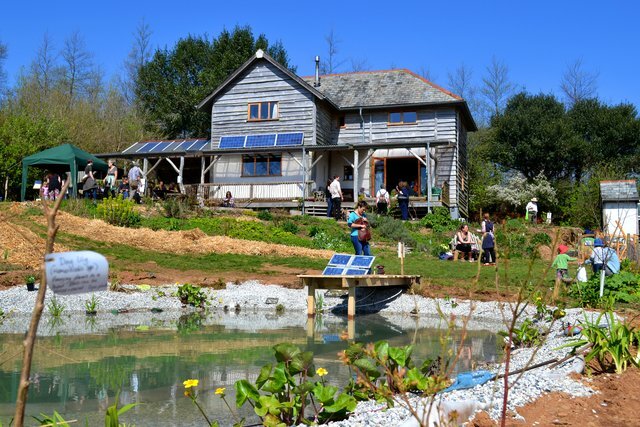 There were talks on biodynamic farming, a wild cookery demonstration and the showing of a film of the straw bale house build on the site. An amazing lunch was provided by the Real Junk Food Project who take food that supermarkets would otherwise throw away and turn it into delicious meals to feed the local community. Having allowed ourselves a pause and a breather we’ve had time to settle and reflect on the day and speak with various people and all in all it seems as though it was a big success. 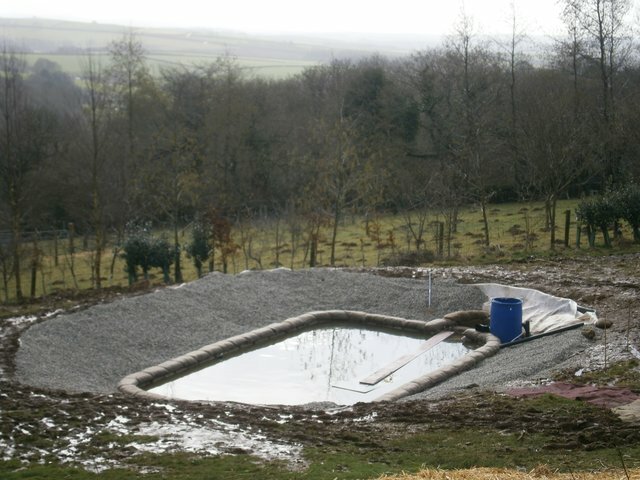 The pond is finished! Unfortunately it is still 3-4 inches below “full” so the filter system is not able to effectively work yet, though initial tests are encouraging so it’s all ready to go once we have had a little more rain. Partly this is due to a leak I discovered in the exit drain pipe, where water was seeping in at a join. After a brainwave I solved this by rolling a section of inner-tube over the pipe to the join, and cable tied either side of it. So far so good I think- but again will know more when next it rains. Adeon was the first to go in the pond albeit VERY briefly, but today Adeon, Elowen and Anthony have all been in for a proper dip- brrrrr! The chestnut and hazel coppice areas we have cut this year are just starting to shoot, so it’s going to be time for us to shoot too… rabbits that is! They are the biggest threat to these young tender stems. We all enjoy rabbit (some call it underground chicken) and it’s a good sustainable source of protein and makes sense in terms of management of the coppice. Rabbit fencing is just economically non-viable in the long term and is far from a sustainable solution. We have a couple of lovely curry recipes we use which I will post as a separate item sometime very soon. The cats are also helping us with the rabbit population, and their way of eating them certainly takes less preparation! Keep an eye out soon for our Bunny Bhuna and Rabbit Rogan Josh recipes. 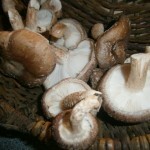 We have had our first flush of mushrooms from our logs for this year… the next ones are in the bath being ‘shocked’ so we should get another flush in a couple of weeks. They are such a tasty and healthy addition to our diet- we love them. Our logs are beech and were inoculated three years ago. The mycelium takes a year or so to run through the log at which point shocking can begin to make them fruit. This is their second fruiting year, and each log can give two or three flushes per year. Coinciding with our open day was the first event of a new project headed by a dear friend of ours Tino Rawnsley. After things finished here on our Open Day at 4pm we hastily packed away the Yurt (kindly lent to us by Kath and Piers) and drove to North Devon to join the tree by tree crew for their special treefest event. Unfortunately we’d missed all the tree planting but we danced the evening away to some fantastic bands and caught up with lots of lovely people. A nice way to round off our busy day. 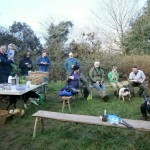 They are now on the look out for the next area of land to purchase to create another Community Woodland. If you know of any possibilities please let us know. With all the resources available to us here, we would like to provide the ultimate green burial shroud. To this end we have tried out various ideas and have chosen to develop this one. 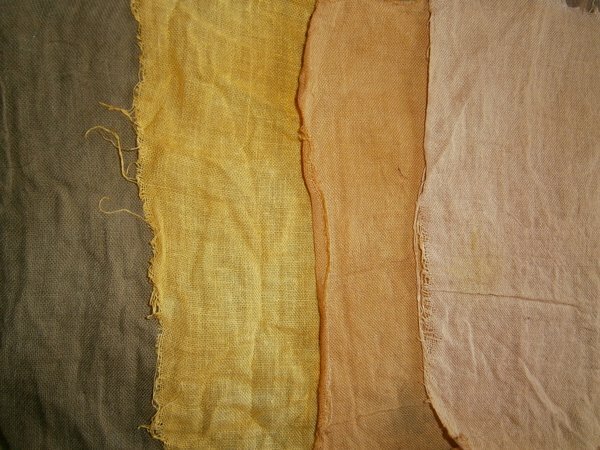 The Pentiddy shroud will be made from 100% Pentiddy materials so there is no mileage on the product at all! A hurdle – either Hazel or Willow, will support a woven shroud made from the wool from our sheep that graze the burial site. 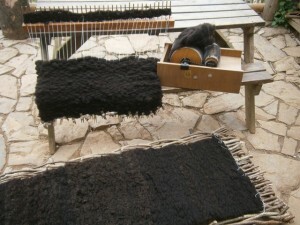 The fleeces would be washed on site and then carded by hand on a drum carder. The weaving would take place here and I’d really love to include any family or friends of the deceased to join in the weaving. For a long time now it has felt very important to me that people can get involved in the making of the coffin or shroud, weaving in their fondest memories along with biodegradable object such as shells, leaves from the garden, letters and even strips of favourite clothing. I believe that to have a part in the creation of a beautiful final resting place for a loved one assists in a healthy grieving process. As this idea is only in the developmental phase we’d be very grateful for any feedback. Stop Press!… First Lambs born this morning! 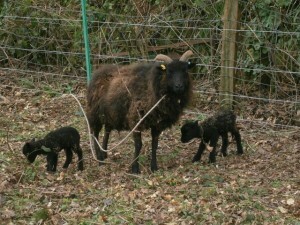 Yes, our first Lambs were born this morning- a successful double from our one remaining Hebridean ewe- we think they are one ram lamb and one ewe, but have not ventured too close as of yet. Mum looks to be doing all the right things which is always a relief. We have two Black Welsh Mountain ewes who look very heavy and ready to lamb soon too, so keeping a close eye on them at the moment. Spring lambs- aahh! Here we are in all our post-build glory! The last of the scaffolding has just come down so in my book that means we’ve finished the house! Time to start a new phase with a new blog. The house build blog will remain accessible via the web site as it may be of use/interest to other would-be straw house builders. This new blog will be a general one to include anything of interest going on here including information about the Community Woodland. Jane, our part-time WWOOFer, is running Everyday Botany through the WEA as a weekend course in the roundhouse with optional camping on May 7th and 8th. This is then to be followed with Community Ecology and Prove it in June and July. 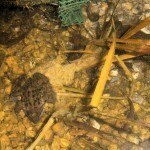 For more information on all of these visit www.wea.org.uk or phone 01872 320036. 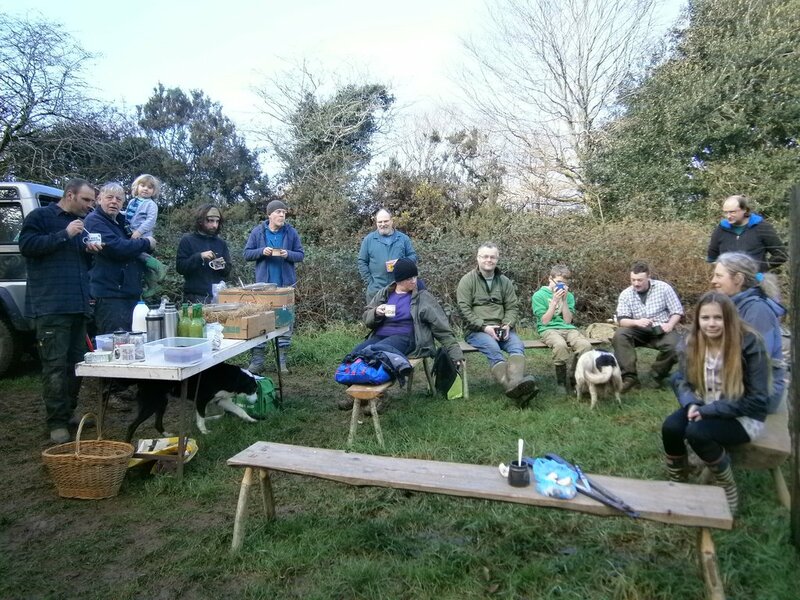 The Cornwall Coppice Group is visiting later this month and we’re hosting the Summer gathering for the SW Art of Mentoring group following on from my attendance at an introductory course in the Autumn. If you agree with me that the way to repair our environment, our communities and ourselves is to re-connect with nature, each other and self then have a look at the website. Such an inspiring movement to be a part of. 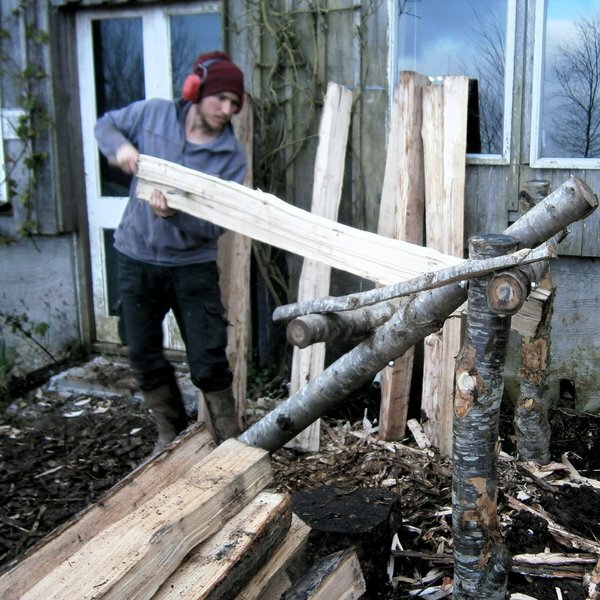 Although Anthony’s workshop space is up-side-down following the build, we are planning to get it back to a functioning state ready for a bent hazel chair course and traditional hay rake course both due to happen over the summer but dates yet to be confirmed. 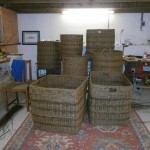 Both these will be run using our first cut of Hazel coppice. We have only cut a very small area but we have sold pretty much all that came out of it for fencing and bean poles which feels very positive. We are taking orders for poles for next year for Hazel and Chestnut so let us know if you’re interested. Food produce wise, we are only aiming to produce enough food for ourselves and volunteers but have recently begun to sell surplus salads to The Growing Project which runs an organic veg box scheme in Pensilva. Ruth is very happy to buy surplus produce from any local organic garden on a week-by-week basis which suits us perfectly. We are also buying a weekly box to see us through the hungry gap and can highly recommend it! 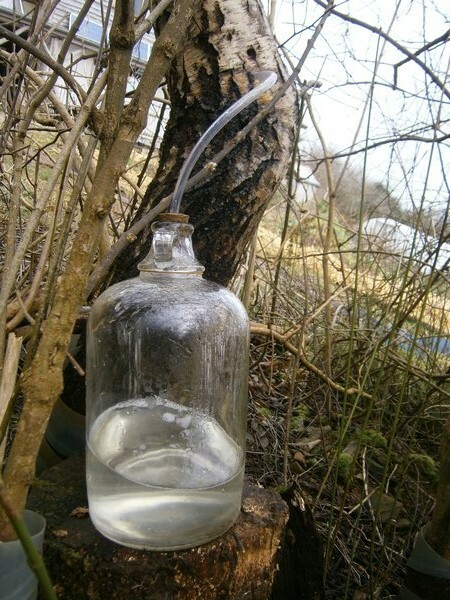 Our present volunteer, Tim, gained experience with his previous hosts in making syrup from Silver Birch sap. We were a little late in the season with our tapping but have succeeded in making a small quantity and will be better prepared for next year. It tastes amazing! We’re also enjoying getting back to brewing with gorse, bramble tip, oak leaf and mint wines on the go and fire cider sitting in a dark cupboard. Pentiddy Natural Burials continues to trickle in the funds to keep the project progressing. We are currently looking at extending the site to enable it to continue for many-a-year to come. 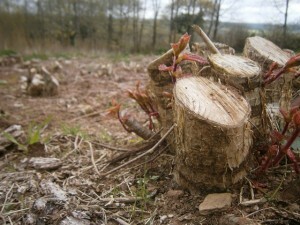 The area to the south of the existing site which was planted with Chestnut as part of our intended coppice has not flourished due to a variety of factors. We are looking at removing the trees and fencing this area to provide more plots available for burial. On a less positive note however, the wooden ‘Pentiddy Community Woodland’ sign at the entrance to the site was vandalised last week and has had to be removed. I won’t rant and say all the things you’re probably thinking, we’ll just carry on doing what we’ve always done and hope that some of the positive community intentions eventually rub off. To help the charity to raise the funds to replace the sign you can of course make a donation or you can order a load of prime ash firewood for next winter. Get in quick! Contact us or call us if this is of interest to you. 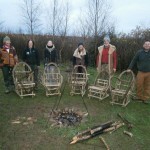 We have a thought of running an open (and no cost) whittling evening sometime in the summer- an opportunity for anyone interested to come and sit around a camp-fire with a cup of tea and a knife and create something of use- a spoon, a hanging hook, a pointy stick…..Please contact us if you would be interested. Sorry, but we were going to have some nice pictures to brighten up the post- but we have a few issues with the uploading process….. maybe the next one I will have ironed out the creases!